The Fluke 125 Industrial ScopeMeter is a rugged, reliable solution for industrial troubleshooting and installation applications. Integrated test tool, with oscilloscope, multimeter, and “paperless” recorder in one affordable, easy-to-use instrument. 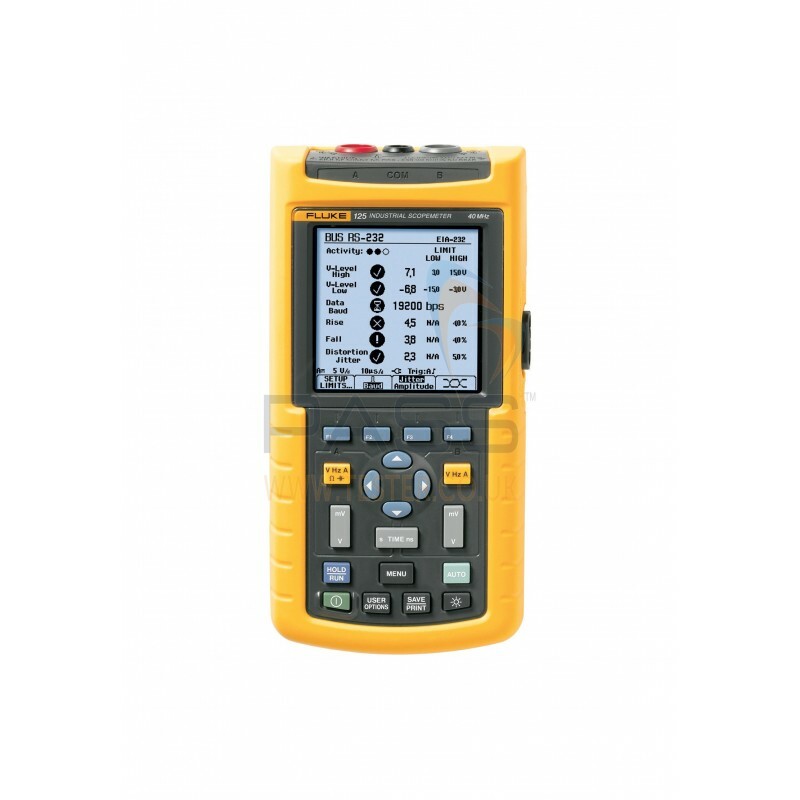 As the latest addition to the Fluke 120 Series ScopeMeters, the Fluke 125 has advanced features for installing and troubleshooting field buses and electrical machines. The ScopeMeter performs a bus health test on industrial buses, for example, which are rapidly becoming a headache for Service, Maintenance and Installation (SMI) engineers. The test quickly determines whether the bus is working and if not, helps to identify the cause. The rugged ScopeMeter works with many Industrial Networks including AS-I bus, CAN-bus, Profibus, Foundation Fieldbus and Ethernet. In addition, the instrument can test power input, sensor timing, motor windings, drive output timing and power measurements – thus eliminating the need for expensive, more specialized test equipment. The bus health tests of the Fluke 125 ScopeMeter find defects like bad or missing terminators, bad cable splits, missing links, incorrect line loading, line interrupts, short circuit conditions and reflections. The instrument continuously acquires the bus signal and compares parameters to official specifications. It displays bus speed and measures signal quality with ‘good’ or ‘bad’ indications for parameters like rise- and fall-time, amplitude, bias level, pulse width and distortion. The instrument checks at the hardware (not protocol) level. An eye-pattern mode allows for a visual check of signal integrity. Power measurements cover single-phase and balanced-3-phase, 3-wire systems (Watt, VA, VAR and Power Factor). Unlike PQ analyzers, the instrument is not restricted to 50/60 Hz, and can measure power at the output of motor drives and frequency converters. The Vpwm measurement capability shows the output voltage of motor drives exactly as the motor perceives it. For electrical and combustion engines, the 125 can indicate revolutions-per-minute (rpm), and can be set up for 1 or 2 rotations per pulse, or 1 rotation per 2 or 4 pulses. A 50-ohm resistance range brings excellent 0.01-ohm resolution for checking motor windings and other wiring. The Fluke ScopeMeter 120 Series performs automated measurements on motor, switch and similar signals. The 123 has a 20 MHz bandwidth, while the 124 is a 40 MHz bandwidth instrument that performs more advanced measurements. The 125 is also a 40 MHz instrument but includes features for testing Field Bus and motors. All incorporate Fluke’s unique Connect-and-View to recognize signal patterns, and automatically set up correct triggering. Bus Health mode gives a clear “Good” / “Bad” indication for the electrical signals on industrial buses and networks, such as CAN-bus, Profi-bus, RS-232 and many more. The Fluke 125 validates the quality of the electrical signals as soon as any electrical signals are passed along the network. It checks the signal levels and speed, transition times and distortion, and compares these to the appropriate standards to help you find errors like improper cable connections and terminators. It helps you find the source of error in case communication comes to a halt. All the commonly found industrial network types are supported!